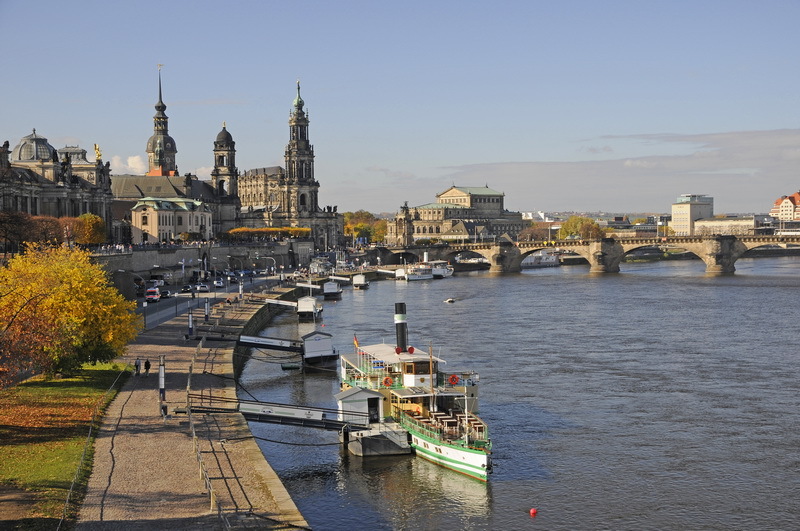 We went for a little stroll through Dresden, a metropolis on the Elbe. We’d like to share our impressions. Especially when it gets dark the scenery becomes fascinating. The Theaterplatz (Theatre Square) is right where the famous Semperoper is and is surrounded by the Taschenberg Palais, the Hofkirche (Court Chapel) and the castle. On the square in the middle is the equestrian statue of King Johann. The Opera dominated the arrangement. This remarkable Italian high renaissance building was completed in 1878. Until the end of World War II, it was the most prestigious stage in the city. After elaborate restoration works the building was reopened in 1986. Sadly, tickets for this marvellous opera house are almost always sold out. 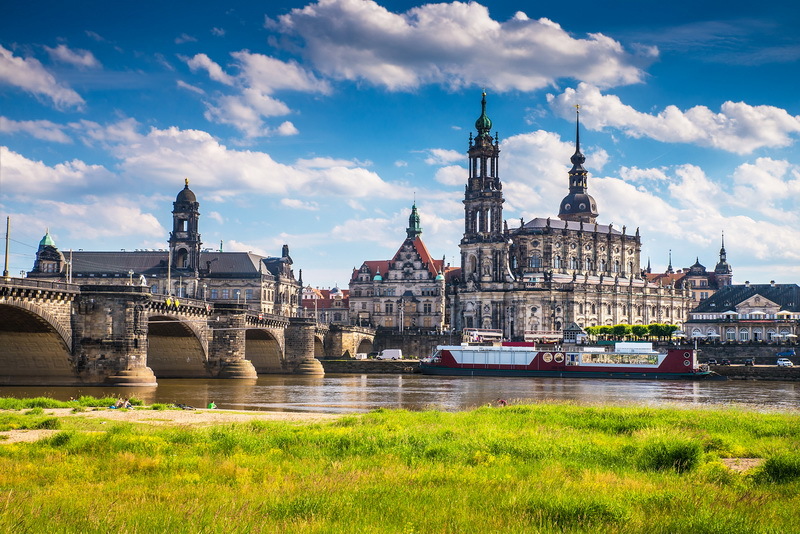 We shall plan ahead for our next trip to Dresden. The Hofkirche (Court Chapel) is also on the same square. It measures 4800 m² which makes it the biggest church in Saxony. This impressive church is made of sandstone, has three naves and a partly detached tower that is 85.5 meters high. Also part of the ensemble is the castle. This is where you find the “Grünes Gewölbe” (Green Vaults). We booked tickets online way ahead of our visit. Tickets are hardly ever available on the same day of the visit. Tickets are issued for a particular time slot and it is recommended to arrive early. Bags, cameras and coats are not allowed in the exhibition rooms - lockers in different sizes are available for safely storing these items. We enjoyed the visit a lot. Jewellery, gold works and valuables made from amber or ivory are displayed next to goblets with gemstones and artistic bronze figurines. 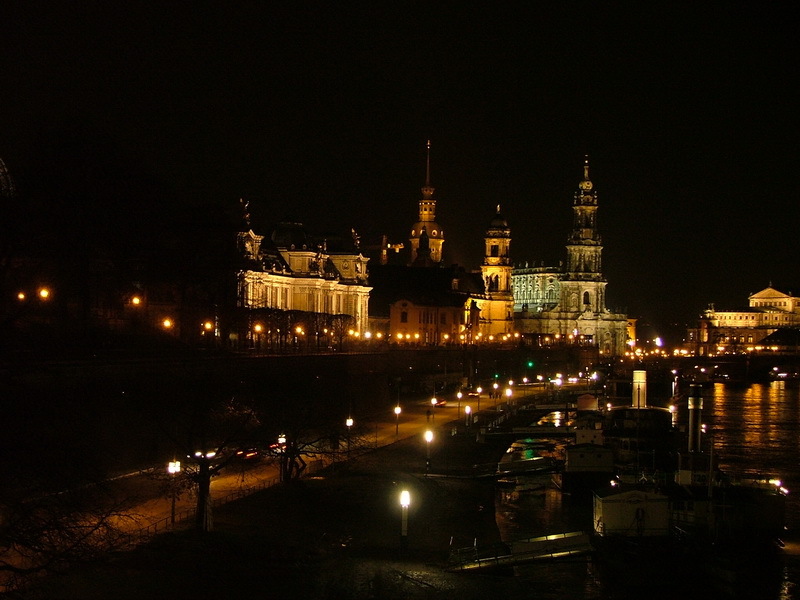 As it slowly got darker we made our way to the Elbe bridges for some memorable impressions.